I've not had a lot of studio time today as exercise is always a priority and since it is sunny although windy and cold, I went for a walk before lunch. This afternoon I have an appointment but did get in a little sewing time. Since I needed a small gift, I rooted around in my painted and printed fabrics to find something I could use. Once again I used a pattern by Atkinson Designs called Bridget's Bagettes. I've almost finished it and decided to write about it because I won't be home for the next couple of days. All that remains is to fold the back fabric to the front and top stitch it down. 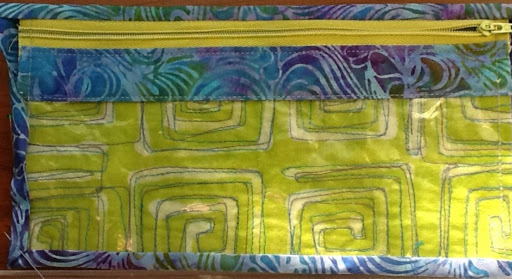 You can see my soy resist painted and stitched fabric through the vinyl front. As you can see, it just fits a roller blade. I was a little headachy upon arising this morning and happily had no commitments for the day. My daughter who's in Korea skyped with me for a while. Then I mixed up some Red River cereal bread and went outside to do a bit of shovelling while it was rising. I went for a short walk too even though it was pretty cold. 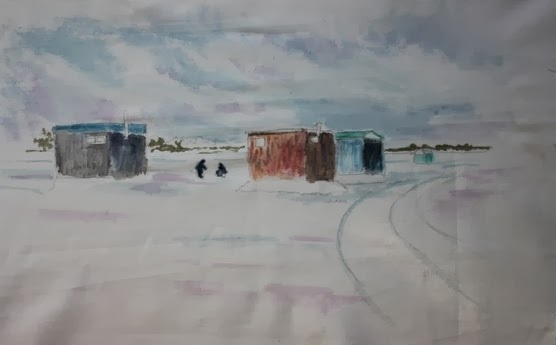 At lunch, I finally took a Tylenol and since I didn't feel like getting into stitching my first fish huts that I wrote about yesterday, I sat down with my Inktense pencils and painted a background for Fish Shacks version 2. I'm waiting for it to dry before I fish the last couple of bits. Also, I'm linking to The Needle and Thread Network. Schools were cancelled here today due to snow. It doesn't affect me anymore since I no longer have children at home but I still feel it's special somehow. I'm lucky to choose to stay home watching the world from my windows and enjoying my creative endeavors. 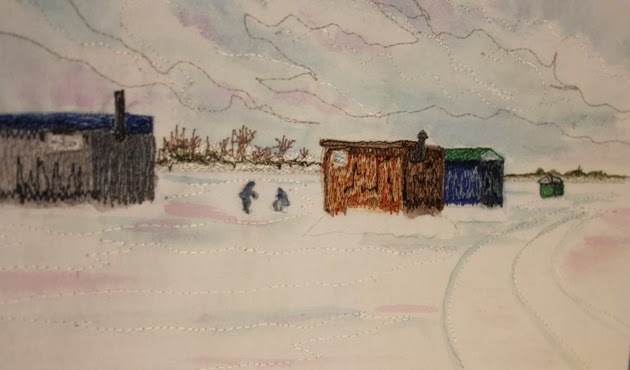 I decided to add borders to my fish shacks along with a batting and another layer of interfacing before moving on with more layers of stitch. I've layered on small bits of light highlights and stitched some lacy trees to the background. Lots of thread changing takes time. I am much happier with how it's coming along at this point and the extra layers have prevented further rippling. There remain just a few small details, the men, a door, some defining lines. I always need to let it rest in between short sessions though so enough for today. I'm saving some time and energy for snow shoveling and supper preparations--veggie meatballs on spaghetti squash. At lunch time today I couldn't help but notice all the birds using our deck feeders and heated bird bath. The only thing I would wish for were I granted a wish, would be a spot and a window large enough for a chair so I could sit and watch them. They are so fascinating and beautiful to watch. 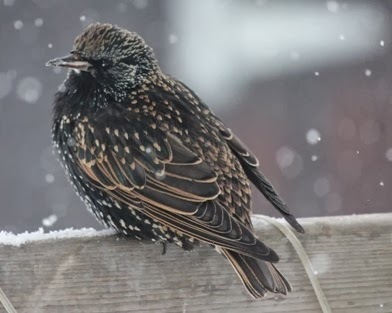 I know that starlings are traditional pests, but really the beauty of this one with it's sparkly plumage sitting amid the lightly falling snow was too pretty to resist. 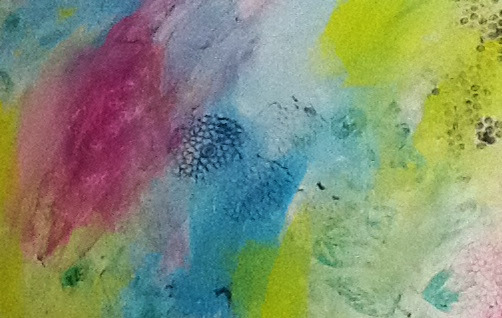 The tiny bright spots really do remind me of a starry night sky. I saw chickadees and goldfinches besides a flock of bluejays that also spent time at the feeder and the bath. There is no end to the possible subjects for future projects, just never enough time! We had a fresh light snowfall last night of about 8 inches, so after our usual leisurely Sunday morning breakfast and crossword, I got dressed to go outside. While Gord was finishing up some painting, I plowed off the steps and walks and cleaned the the car. He went out with the snow blower after lunch to finish up. This afternoon we were both too tuckered out to go snowshoeing. 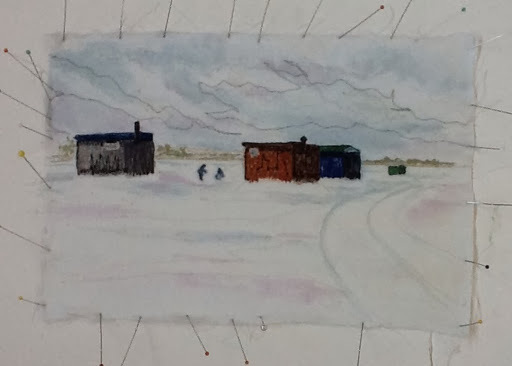 That meant I could go into my sewing studio and do some thread painting on the fish shack piece. This continues to be a learning experience for me. I backed it with stiff interfacing but still I was getting some puckering in the fabric which always bothers me. I did most of the stitching and decided to wet it and block it out with pins. On the next piece I'm going to try doubling the interfacing. My camera battery light came on. I switched to the I Pad taking pictures in different rooms trying to get the lighting right. The color shows a little darker than it actually is but still I think the photo helps to show me that I could add some lighter shades here and there. I haven't done the two figures yet, nor have I sandwiched it. Perhaps an option next time might be to add the batting from the start. And the 2nd one that I sketched on fabric the other day that I thought was a loss was saved. It had a seemingly stubborn pleat going through it. I wet it thoroughly, wrung it out and ironed it. I got it out. You can just make out the light pencil marks of the sketch which is taped to foam core board ready for painting. I hope you're having a creative and relaxing Sunday! 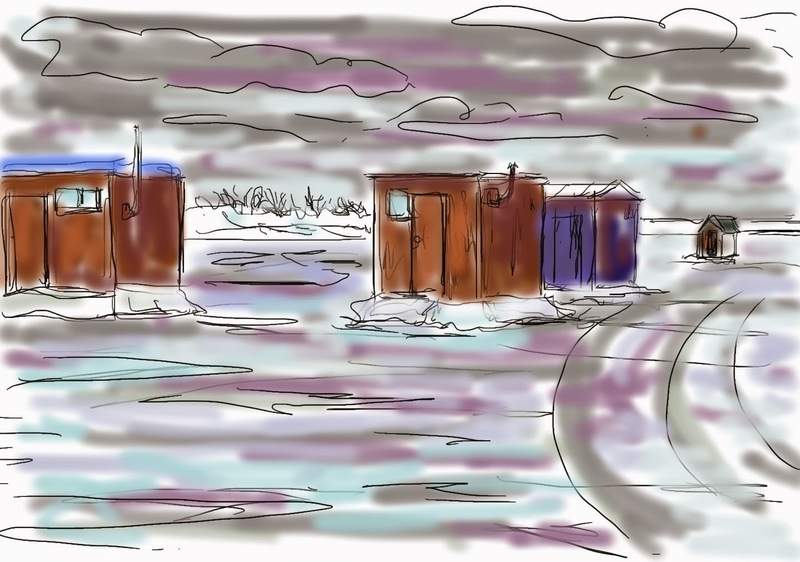 Today was an 'at home' day and I had lots of ideas about what I wanted to get done with the fish shack theme. However, I had a bit of a late start do to a restless night's sleep. My husband came home for lunch and I also decided that I needed to get out for a walk on my favorite trail. The sun was shining and the air was cold and crispy. As soon as I got in and made a cup of tea, I got some cotton fabric out drew some fish shacks on to it. 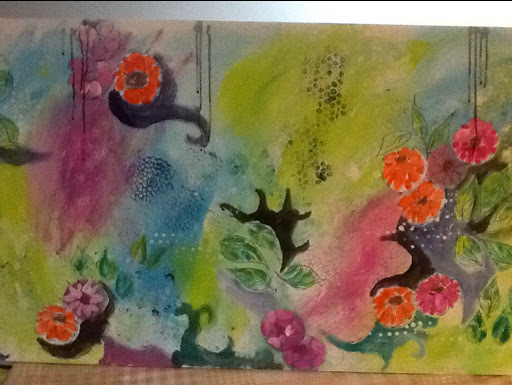 I stretched it onto a piece of foam core and loosely painted it using Derwent pencils and Derwent blocks. 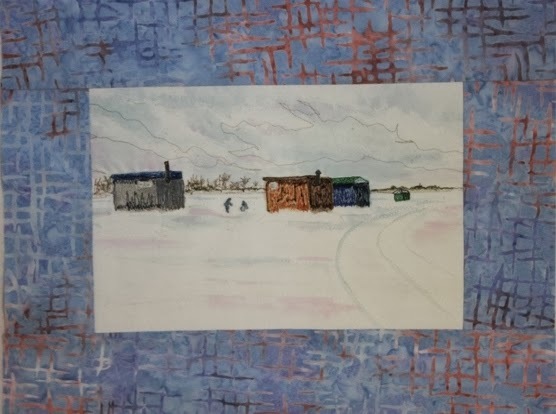 What I did on the shacks was to color with he pencils and then use textile medium to blend with. fro the more softly shaded areas, I used the color from the blocks added to a small puddle of medium on my tray and then applied it to the fabric. I actually had 2 scenes drawn onto fabric but the first one had a crease running through it that I was afraid would not come out, so I'll have to do it again on fresh fabric. The one above measures about 8 by 10". Next step will be to heat set it once dry on the weekend, sandwich it. Then it'll be ready for some thread painting and quilting. I also want to show you a little sketch that I learned to do on my I Pad using the Sketch Club App. iI is new for me and since I don't have photo software, the idea of layers was totally foreign. Eventually, I got it mostly figured out. My little sketch isn't anything like a more experienced artist could do but I will admit I'm pretty pleased with myself to have gotten this far! Today, we've plunged into frigid temperatures again, -14C after lunch. It was sunny though so I went for a walk. 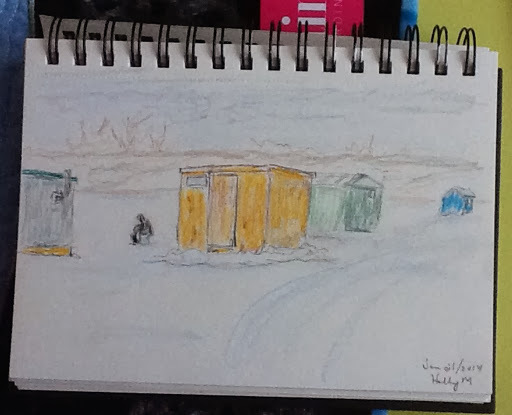 I've just come from my computer desk where I did a few quick sketches of the fish shacks using my photos from the other day as reference. I used pencil and colored pencils in a very quick manner. I'm just trying to get a feel for how I'd like to paint them on fabric. 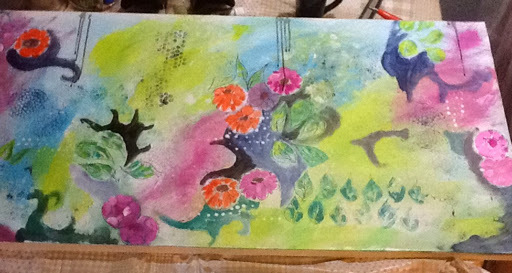 The one above I like but I can already see I need to move the figures off center a bit as a focal point. I would probably cut out the fourth shack on the left. I didn't like the perspective on the one above even though it looks like that in the photo. The last one I kind of like but again, I'd probably take the fourth shack on the right out and add the other two men in. This is why it's good to do lots of sketches before going to fabric. Sometimes it's good on the first try. Other times, one needs to try lots of alternatives. On Monday mornings my first priority is to get some housework done so I can concentrate on the fun stuff for the rest of the week. That is exactly what I did today. I even washed sheets and hung them out. It was breezy with temperatures around 0C. It is slowly getting colder though. We are plunging into a deep freeze again tomorrow. 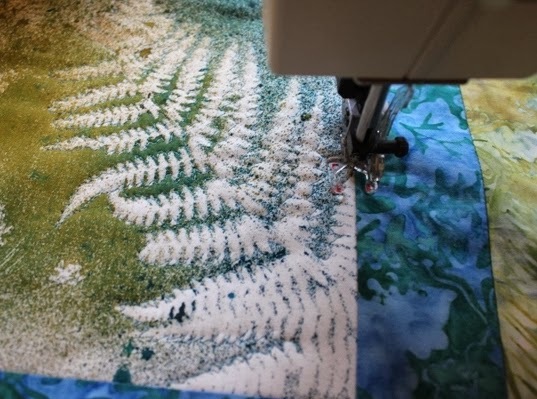 I got right into quilting my fern runner after lunch, outlining the floral motifs in the middle with free motion stitching and silk thread. I was tempted to continue with a meandering free motion to finish the runner, but instead decided to keep it simple. I straight stitched along the straight lines. Tomorrow I should be able to get a binding on it. 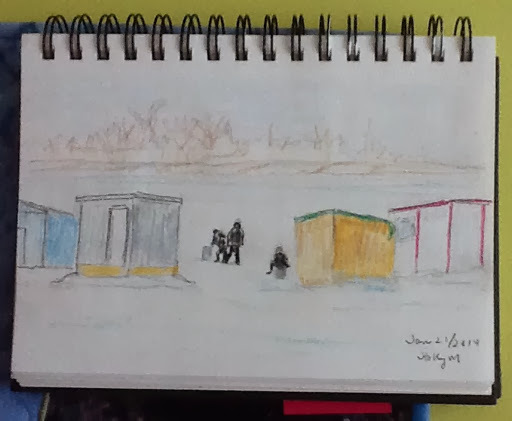 While my husband watched the golf after supper last night, I brought up a couple of my ice hut photos on my I Pad so I could do a little sketching. This was done in my lap with my feet up on the coffee table. I used watercolor pencils with a water filled paint brush. No mess, no fuss. I think I would like to try doing some fish huts in fiber as my next project. I'm leaning towards painting on fabric and adding thread stitching to it rather than using appliqué. Not quite sure yet. I hope you're staying warm and creative on this Monday! Sometimes on Sunday I like to take a drive and snap a few photos. After a leisurely breakfast and a session with tea, coffee and the weekend paper (Gord reads, I do the crossword), we headed out for a little drive. 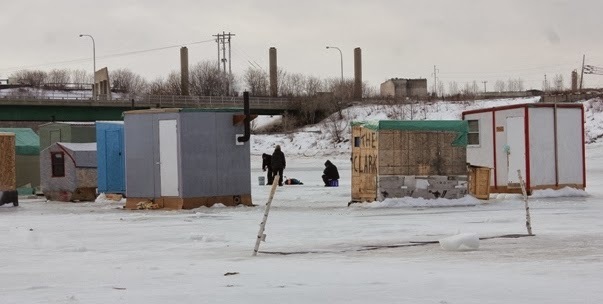 Over in east as they call it, we drove down to the wharf and took a walk out onto the ice where they are ice fishing for smelts. As you can see ibn the above photo, there were a few men outside fishing through a hole. Normally, it would be pretty cold for that. We were cold just standing taking pictures. the temps are quite mild right now. It's like a little village out there. Some of the huts even have wood stoves. Besides the fishing, it is also quite a social thing for most of the men. As we were walking back to shore, my husband pointed out the unique profile of the wharf and breakwater in the background. 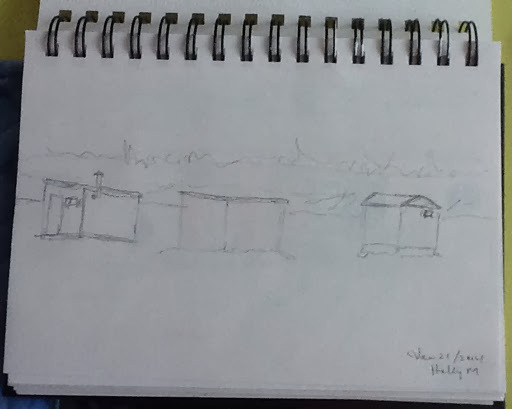 Being so intent on the huts, I hadn't noticed it but had to admit it was pretty interesting. We then picked up a few groceries, had lunch and visited my in laws. 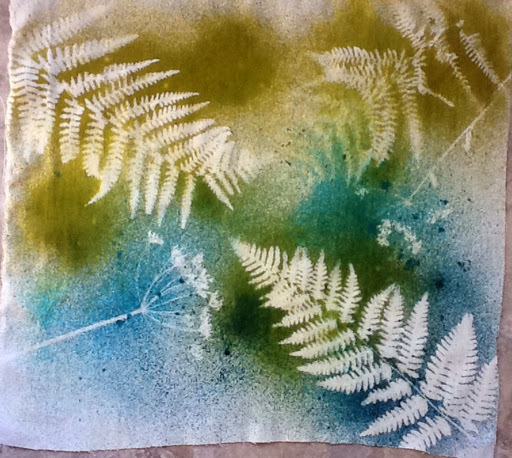 We were home by mid afternoon, giving me enough time to upload my photos and get my fern runner sandwiched. I threaded the machine, did a test patch and couldn't wait to get a little of the stitching done. The rest will have to wait until another day. I just made up this oven baked fajita mix that I saw on Facebook a half hour ago. I substituted tofu for the chicken. It bakes in a 400F oven for about 20-25 minutes. I couldn't seem to copy a link but I'm sure you'd find recipes if you search. 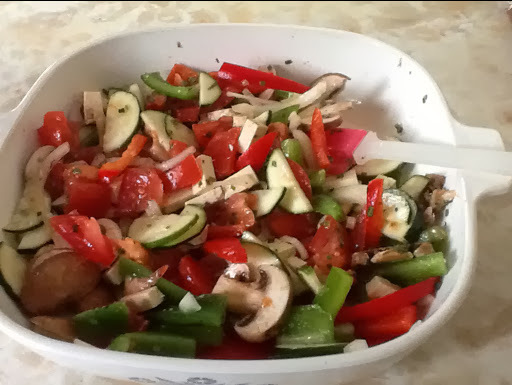 It'll be a simple but healthy supper! Right now I'm feeling pretty satisfied with myself and my day! As always, I had a slow start this morning, but once I got moving, I've been on a roll! I got some wash done. I needed the sashing fabric washed and ironed so I could get it ready to take to my UFO day Saturday. 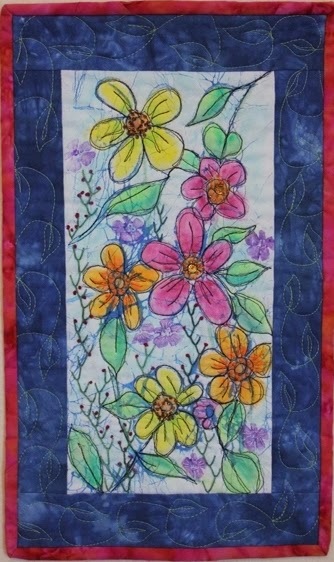 I plan to do some cutting for my next quilt. First, though, I needed to do a sample of the Garden Fence block to make sure the dimensions suited. I went with a 5 1/2" center which resulted in a 11 1/2" block. I just hope I'll be able to see myself through enough blocks for a queen size quilt. It will be my project for retreats and UFO days for the next year. At least I'll have some good company to relieve the tedium! 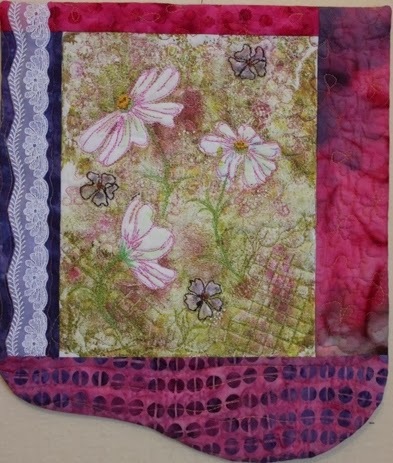 Art quilting is my true love and it is what I spend my time at most days. It's too hard to pack up everything one might need for a retreat so a traditional quilt is a perfect tote along. By lunch time I had also managed to finish piecing the top of my fern runner and then trimmed it. 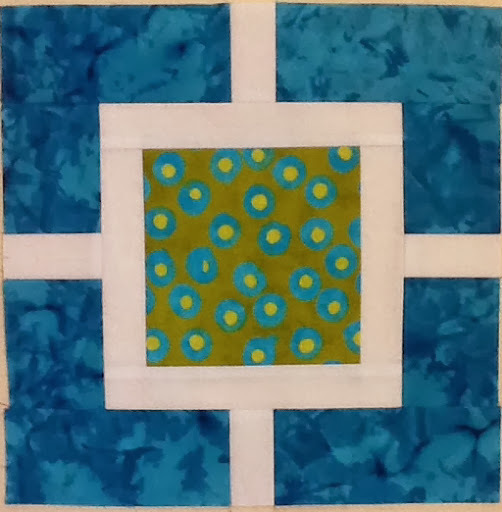 The green in the 2nd last border is not as dark as it shows here. Since tomorrow I'll be out most if the day, I'll have to wait for maybe Sunday to get it sandwiched and ready for the free motion quilting. That's the fun part for me! After lunch I felt that I needed a little fresh air. It's pretty messy for walking with all the water and ice on our streets so I took the ice chopper and broke up a little of the ice on our driveway. 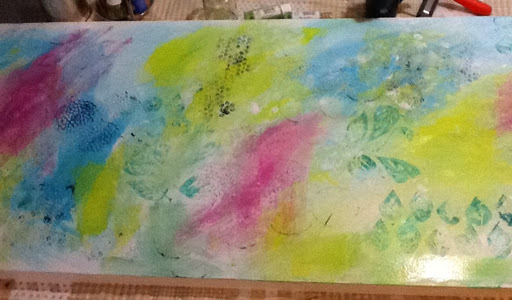 Then I took a half hour to coat a piece of heavy canvas with a base layer of color. 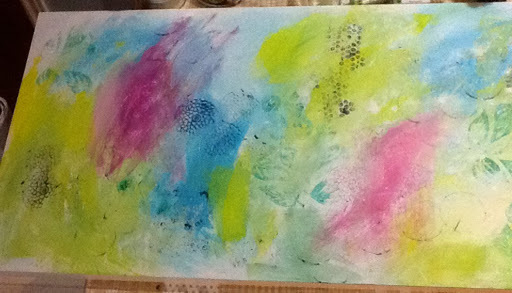 The next layer will include more color, some printing, screen printing and maybe some doodling. This may end up being torn into bits to be used for smaller projects. I've taken all my photos today with the I Pad, not wanting to stop my momentum with my projects. I'll pull out the camera when I get further along in the runner and the painting. The rest of my day will be a little quieter and may involve some knitting. Yesterday, Gord and I drove to Moncton where I planned to pick up some supples. I was very disappointed to find that Fabricville was all out of the canvas that I wanted to paint on. I did get a large stretched canvas with a coupon from Michael's at least. And I visited the Fabric Cupboard where I bought some yardage of a Bella solid for my next quilt as well as some batiks in my favourite colors. They were very helpful! I planned to spend this afternoon finishing the strips on my runner but a friend called asking me to go with her to a little shop about an hour from here. It was her birthday what could I say! So I came home with a couple more fat quarters. I did get one more set of strips on before she called. There are just two more colors to finish it. I've cropped it along the lines where it will be trimmed. I can't wait to start quilting it! 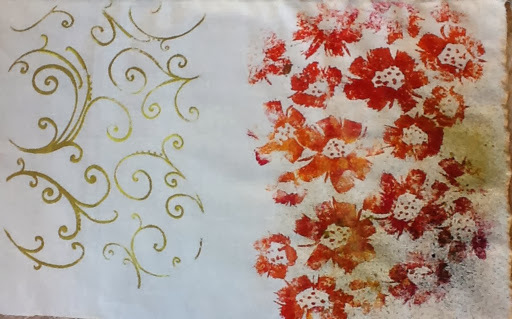 I was really intrigued with the colors and patterns in the ferns that I spray painted last Thursday onto the white cotton, so I decided to start adding strips to make it into a table runner. 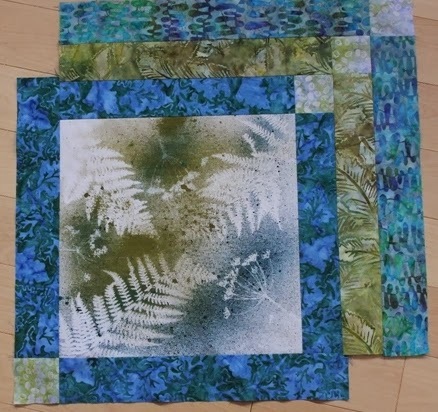 I'm using blue and green batiks. Love these colors! After doing a few strips, I decided to stop for a couple of reasons. I'm lacking a nice mossy green. 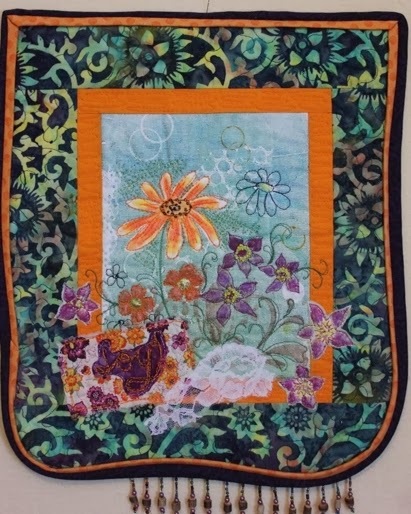 On Monday, I'm going to Moncton and will visit a quilt shop; I will wait and see what they might have. Here is the tutoriol for the runner. I made it with the Halloween fabrics in the fall and really liked how it went together. 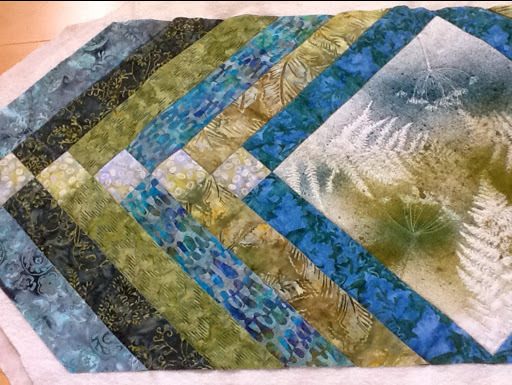 The fern center section is a little bigger than the pattern, so I adjusted the strip lengths to suit. I will add free motion stitching to it once it is all pieced and sandwiched. Also, my back was bothering me a bit so I've grabbed my favorite snack to eat while writing this post and sitting back in my comfortable computer chair--pomegranate with cottage cheese--does that sound weird? The other thing I need to do since bringing my art quilts home from our local shop which closes until late spring, is to add a few items to my Etsy shop. Since it takes time to do, I've decided to break it down into bits, adding an item here and there. I've just made the draw for one of my small art quilts.I haven't yet figured out the on line random number thingy, so I threw the names in a bag and my husband chose for me. The winner is Annie S and she chose Cosmos! Congratulations! Thanks to everyone for the nice words about my work. Yesterday, I went back to my Wednesday lap swim after missing it over the holidays. Since I don't have landscapes to ponder like when I'm out walking, I spend my time while I'm swimming thinking about future fiber art. I had lots of ideas and images going through my mind. Because I didn't do any fiber work over the holidays and also because I'm taking the painting class, my fingers are getting itchy for some fiber. So after my morning chores--I actually hung the clothes out--it was a balmy -10 with a good wind, I got out some PFD fabric, ironed it and cut it up into pieces. 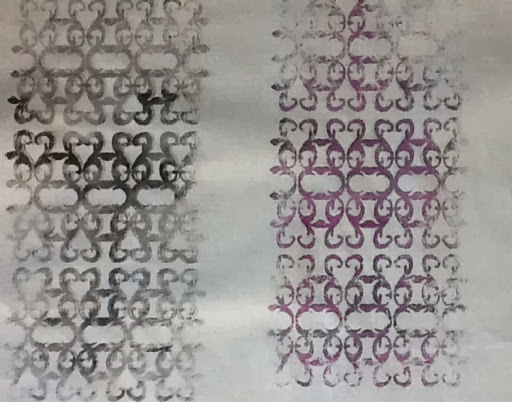 These 2 pieces I did using pressed flowers saved in old phone books and fabric sprays. I envision them in table runners. I've already trimmed one up and chosen some batiks to go with. I did a second one just in case. Next, I wanted to do some plain screen prints on white fabric. I will add a transparent background color later so they're only half done at this point. I don't use these as background for my fiber art, but rather as bits of color and texture in my borders usually. Don't forget if you want in on my giveaway, go back to my last post and leave a comment. 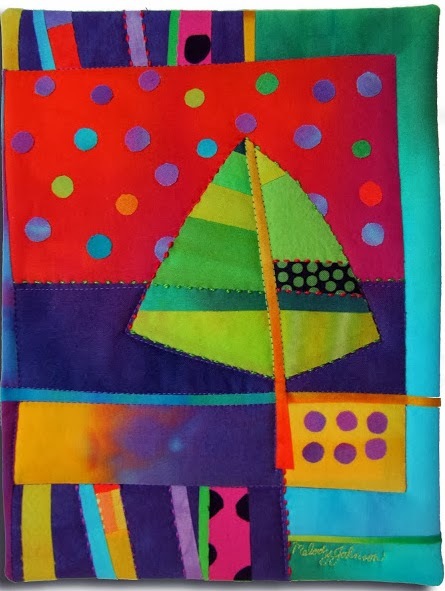 Earlier in December, some of you may have read about the art quilt that was anonymously commissioned for me by one of my very kind and generous readers. I received this sweet little art quilt made by Melody at Fibermania on Christmas Eve. How's that for timing? Isn't it sweet? This blogging world is wonderful! I've taken this long to get around to writing about it because I had something in mind. I want to pay my lovely surprise forward and I needed to bring home my work from the local shop and I needed to take some photos. This one measures about 9 1/2" by 16". The next one called Joy measures about 13" by 15". This last one, Cosmos, measures about 11 1/2" by 13 1/2". Leave me a comment with your choice and I'll draw the winner on Friday night January 10th, DST. The giveaway draw is now closed. Congrats to Annie S! We started out with snow this morning, then rain, and now freezing rain. It's supposed to get very cold again later and I'm trying not to be too worried about the possibility of power outages. They've been happening with more frequency. Gord and I were just discussing it yesterday. We have only electric heat with no back up. Fingers crossed. I've stayed on all day, having a very domestic type of day, a bit of cleaning, washing the bed sheets, and baking. 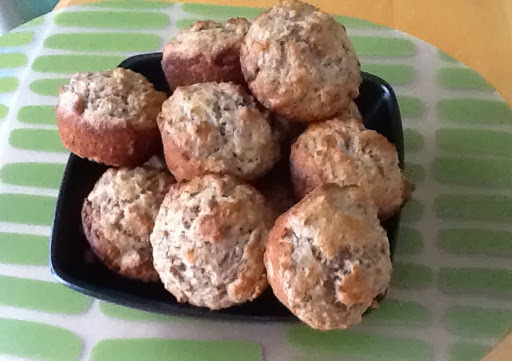 I made Banana Raisin muffins And had one to go with my salad at lunch. 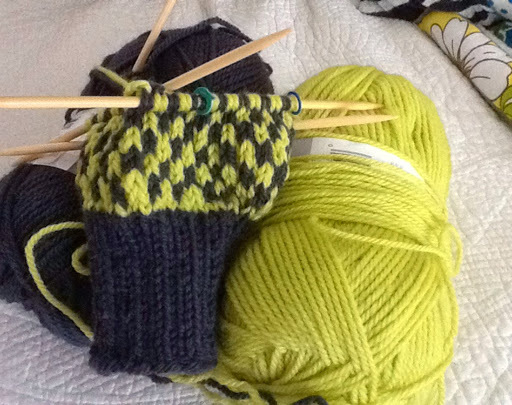 I've also got another knitting project on the needles. Last year, I got a book with traditional wool mitten patterns. I bought the yarn and finally got around to starting a pair last night. I have a pair that I bought at a craft sale about 30 years ago that I still wear snow shoeing and they're plenty warm. I'm hoping these will be too. The dark color looks black but it is actually a charcoal grey. 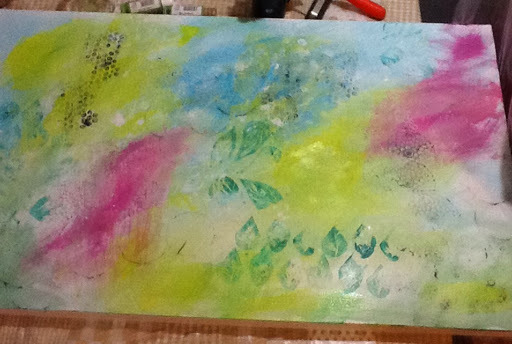 After lunch, I sat and watched a few more videos from my painting course with Alicia Burke. 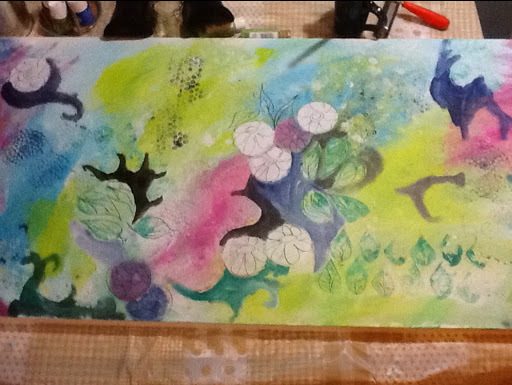 Then I went down to work on adding more layers to my large piece. This is the centre part of the door with some paint and doodling added. I know the pictures here are not great. I used the I pad and it is in the basement. I'm not sure what to think about the piece. It is a really fun process though and that's what it's all about isn't it? I continued, adding some black pen and some more color. Next up is the lesson on adding a focal point. I'm planning tree branches and hopefully a bird. I know the style may not be to everyone's liking and I'm not sure if I'll want to hang them. It is a fun learning experience though and I will probably try more before I'm done. And I will take a better final photo with my camera once it's done. A handful of us showed up for our UFO day at the civic center Today. It was so lovely to sit and chat and sew with friends again. Better than therapy! I made a few scrappy Trip Around the World blocks but didn't take a picture. Yesterday when we snowshoes it was late in the day, so I didn't take a camera. The sky just before sunset was so pretty on our way back that I tried to commit it to memory. I did this quick sketch with colored pencils right after my supper went into the oven. That was my bit of creativity for yesterday. Gord and I ventured out for an errand into -23C temps this morning and when we returned to our car, it wouldn't start. My husband suspected a frozen gas line. The battery wasn't dead although it was heading there while trying to start the car. We were near a department store so he headed over to buy some gas line anti freeze while I went to talk to someone we knew who had pulled in to the lot. It still wouldn't start so we left it and went with our friend on a couple of errands. When we returned and tried it with the help of booster cables it started. Whew. After lunch I went to my drawing table set up downstairs and got set up to paint a background on an old door that my husband sanded and primed for me last summer. Yesterday, I noticed that one of my favourite artists, Alicia Burke, had a sale on all her classes and there was one in particular that caught my eye. Sorry, the sale ended yesterday! I've had that door on my to do list for some time and when I saw her Larger than Life class, I thought it would be perfect. After watching the first couple of lessons, here's what I did today. This is the left side. The whole door or most of it. It's too wide to get it all in. Here's a closer view of one section. That's as far as I've watched for now. 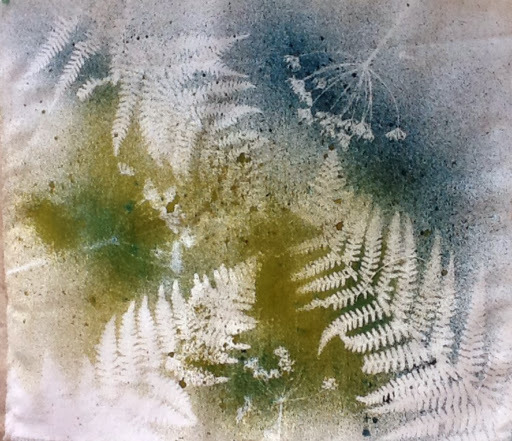 I know I will have to think about what kinds of things I would like to depict, perhaps birds and flowers which are usually my favourite subject. So those of you who follow me for my quilt art will have to bear with me for a bit while I get the most from the course that I can. 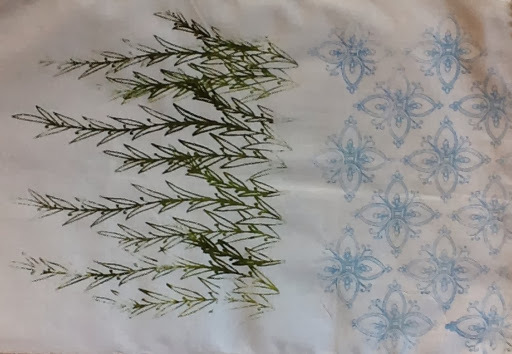 I'm sure you'll see some of the techniques and drawings or doodles cross over into my fabric art eventually.